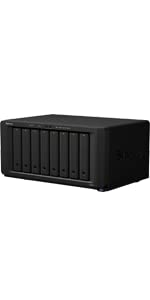 Built with a quad-core processor, an AES-NI hardware encryption engine, Btrfs file system support, and 1080p video transcoding, the DiskStation DS1618+ 6-Bay NAS Enclosure from Synology is a high-performance system designed for tackling multitasking challenges and provides storage scalability for tech enthusiasts and small- to medium-sized businesses by handling workloads. Further boost storage performance with the by installing a dual M.2 SATA SSD card for high-IOPS system caching or enhance network speeds by adding a 10GbE NIC. 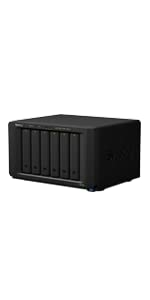 This NAS is equipped with six drive bays that are capable of natively supporting 3.5″ SATA hard drives, as well as 2.5″ SATA hard drives and SSDs for data storage, plus two M.2 2242/2260/2280 SSD slots for caching. 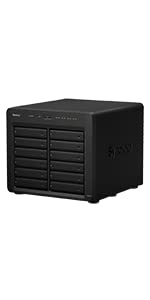 Using its six drive bays, this NAS will allow you to store and share many files, including videos, music, photos, and documents with up to 2048 user accounts and 1000 maximum concurrent connections. 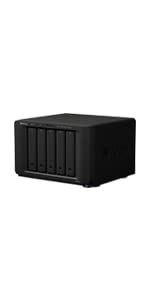 DiskStation offers massive storage capacity for storing and protecting all your files and important data. 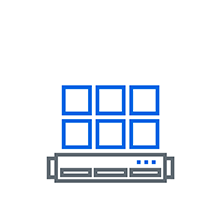 As your storage needs grow, you can easily scale up capacity by adding additional storage expansion units. Tailor performance to your needs with the upgradable memory or take advantage of the PCIe slot to install a 10GbE network card for blazing data transmission or an M.2 SSD adapter card for high IOPS caching. With comprehensive support for all major file sharing protocols — like CIFS, AFP, NFS, FTP and more — DiskStation lets you centralize files in one place and access them using any device. 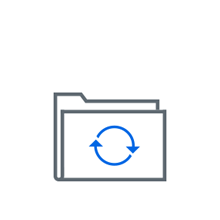 Take files on the road or easily share them with other people, thanks to Synology’s easy file sharing and syncing software. Ensure data remains safe by backing up your computers, servers, and virtual machines to DiskStation, and defend yourself from human-error or ransomware with the multi-version backup. Finally, avoid disaster with the ability to easily back up DiskStation to an offsite location or to any major cloud service. With support for VMware, Citrix, and Microsoft Hyper-V, DiskStation serves as a seamless storage solution for virtualization environments. 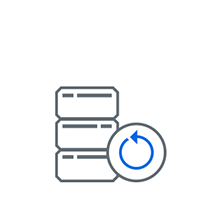 Additionally, Synology’s Virtual Machine Manager also lets you set up and run various virtual machines directly on DiskStation, including Windows, Linux, and Virtual DSM. 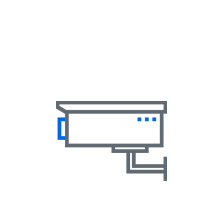 Make your own video surveillance hub. Surveillance Station helps you protect your home or business by offering the ability to manage multiple network cameras, check live camera feeds from anywhere with the mobile app, catch suspicious incidents quickly with intelligent alerts, and easily find relevant recordings.